5 Bedroom House For Sale in Evesham for Offers in excess of £650,000. 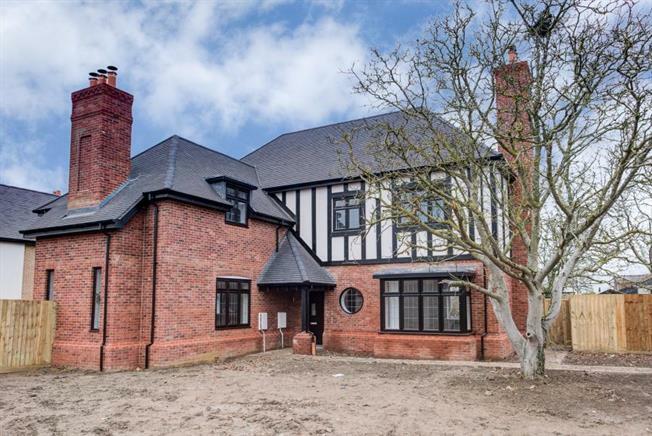 An imposing and substantial brand new detached 5 bedroom family home enjoying an excellent position within the prestigious Kingshust development with detached triple garage, extensive parking, generous wrap around gardens and an attached small orchard available by separate negotiation. The property opens with a welcoming entrance hall with doors leading to the sitting room, dining room, breakfast kitchen, family room and cloakroom. The dual aspect sitting room is of an excellent size with a lovely deep bay window and the dining room is a flexible reception room which could also be used as a study/music room. The beautifully appointed kitchen breakfast room delivers a good range of wall and floor cupboards including a central island all with granite work surfaces, double Belfast sink and integrated appliances. This leads through to a light and spacious family room with bi fold doors opening to the garden. At first floor level the property continues to impress with a superb master bedroom with en-suite. There is a second bedroom with en-suite and three further bedrooms served by a stylish family bathroom. Overall, the property is finished to an exacting standard with quality fittings throughout. A particular feature is the fantastic plot size which offers wrap around gardens, detached triple garage block, extensive parking and by separate negotiation, an attached small orchard.